Payment acceptance is easier when integrated directly into your own environment. Whether it’s a shopping cart on your website, a mobile app you’ve created or the ERP that runs your organization – you can easily integrate it with the CardConnect Gateway and ensure that your customers are protected with our patented tokenization technology. 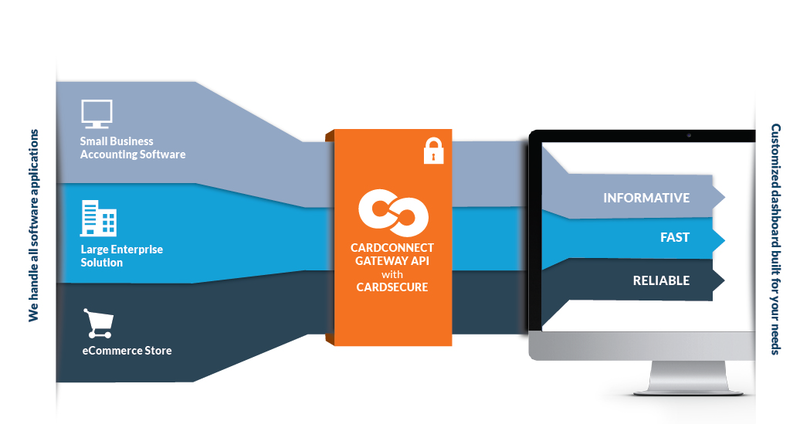 The CardConnect Gateway protects your customers and your reputation with CardSecure, our patented tokenizer that protects sensitive information from breaches and hacks and takes your applications out of PCI Compliance scope. From swipe terminals and iPhone mobile readers to our Ajax Tokenizer and Virtual Terminal, the CardConnect Gateway is designed to integrate all of your various payment acceptance methods into one centralized, secure solution with exceptional interchange optimization. If you prefer to maintain your payment processor of record, that’s not a problem. The CardConnect Gateway connects to First Data, Vantiv, Bank of America Merchant Services, Elavon, Chase Paymentech and more. Accommodate your customers’ preferences by accepting a wide variety of payment methods, including: Visa, MasterCard, Discover, American Express, ACH, eChecks, JCB, PIN-less debit and more. Stop losing money with flat-rate processing. The CardConnect Gateway is specially designed for interchange optimization passing both Level II and Level III data, meaning you get the lowest rate possible for each transaction. The CardConnect Gateway collects vital business data like settlements, deposits, and statements – all in one place. Our customizable reconciliation solution ensures reconciling cash-to-receipts is integrated and automated. Users of the CardConnect Gateway are put in immediate contact with our technical support and development teams, providing incredible resources for properly integrating payments into your applications and systems. From local coffee shops to global brands, CardConnect supports the likes of GE, Jelly Belly, Intelligentsia Coffee & Tea and Mount Sinai Hospital. Get in touch with us today and join our diverse family. Learn more about the CardConnect Gateway and how this omni-commerce payment solution can connect your business to the major credit card processing networks. Learn about how the Rhode Island Transportation and Bridge Authority was able to bring secure payment processing to their custom ERP using CardConnect’s enterprise resource planning solutions. The CardConnect Gateway API permits businesses to accept payments through any channel they choose. Take a look at this document and discover our API’s best-in-class features. The CardConnect Gateway provides businesses with an extra layer of security with our encryption and patented tokenization. Learn more today!